In June of 2001 we moved into our new house. First things first: in November 2001, with the help of friends (thanks, Pete! ), we replaced the front door stoop with a larger concrete porch and a long gradual ramp, which we were able to do because of the distance between the driveway and the frontdoor. It looks really nice and is not obtrusive. Delivery people love it. The work was done by my husband and a couple of friends from work, one of whom is a carpenter turned computer programmer. He did the concrete finishing, and it’s beautiful. We thought long and hard about whether we wanted to make the second floor accessible, or turn the living room/half bath into a master bedroom/bath. Initially the decision was made kind of by accident in the process of remodeling the current master bathroom. This bathroom was a dark cave and had some water damage to the subfloor, so we wound up ripping out pretty much everything, including the 28 inch pocket door and wall between the vanity and the toilet. Now we have a 5×8 foot bathroom with one 36 inch base cabinet with drawers, the sink mounted in an open 30 inch high cabinet so that I can get under it, a tub with a shower seat, and two beautiful awning windows! 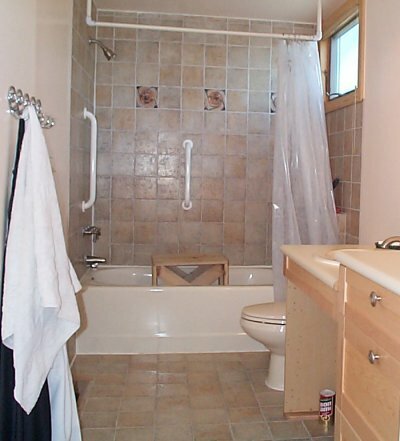 The tub has perfect grab bars, and the towel hooks are at about 40 inches so they are easy to reach. Again, all the work was done by my husband. How wide is it? This wide! Since the bathroom is so accessible, we were able to stick with the upstairs master bedroom for quite a while. We got a second wheelchair, and have gotten a stairlift, a Bruno Electra-Ride II, so I can go from the first floor to the second floor completely independently! We still need to widen the door to the other bathroom, but that’s not as urgent now. We brought a gas stovetop with us, and sold the electric range/oven that came with the house. My husband built a beautiful curly maple counter for the stovetop, with big drawers on each side and an open area in between. Drawers are the way to go instead of cabinets with shelves! I keep all my pots and pans in the drawers, and can pull them out and reach everything. What with one thing and another the stovetop wound up a little too high (32 inches), so I need to figure out some way to mount a mirror above it so that I can see into the pots. We also removed the base cabinet under the sink. As you can see, this means that cleaning supplies are out in the open. Luckily we don’t have to worry about child-proofing anymore (thank you, children, for growing up), but it is a concern when the nephews visit. We still need a solution to the problem of the sink and refrigerator being so far away from the stove. They are on opposite sides of a 15 foot wide kitchen. I know hardly anybody has the problem of their kitchen being too large! I’m hesitant to put in an island, since that just is another thing to maneuver around, but maybe that’s the answer. Another possibility is to get a long narrow table (on wheels) and put it in the middle as a resting spot for ingredients and pans of water. I’d like to find more creative ways to modify the kitchen. In Margaret Wylde’s book (see Resources, below) there’s a picture of a kitchen in which there are cantilevered counters all around the perimeter, with drawer units on wheels that fit under them. This seems to offer a lot of flexibility. We decided against plan A for various reasons and have implemented a modification of Plan B. The living room was the result of a previous remodel. It used to be an attached garage, and is two steps (21 inches) below the rest of the house. We reduced the living room footprint (the master bedroom/bath will use some of that space) and brought the floor up to the same height as the rest of house. This enabled us to build a true roll-in shower with a dropped pan without compromising joist integrity. The new living room floor has radiant heat (no heat ducts go to this part of the house) and a red oak floor. It’s very comfortable in the winter and in the summer. The work was done by my husband and children, who mostly helped with pounding the water hoses into the grooves in purpose built floor panels. My husband indulged me by custom-making the 5 inch tall baseboards that we are putting in all new rooms. The space we stole from the living room became the master bath and closet. The family room became a bedroom and laundry room. The laundry room has a washer, dryer and utility sink (something the house was completely lacking!) and room for cat/dog food. The bedroom has a pocket door, to avoid space problems in an area with four entrances (stairs down to basement, laundry room, powder room, bedroom). The wall between the bedroom and laundry room was framed deeper than usual to provide increased sound insulation. Electic outlets and phone jacks were placed slightly higher than usual. The floor in this room is also oak. We considered retrofitting this room for radiant heat, but the living room was so much work we bagged that. The bathroom, though, is on the new raised floor, so it does have radiant heat. The sink is mounted lower than usual in a countertop with no cabinet underneath. I got a really big mirror so that you can see yourself whether you’re sitting or standing. The garage: right now I leave my car in the driveway, and another family member puts it away for me and gets it out. Maybe if we rearrange the garage or the cars we can get enough space for me to load/unload in the garage. The living room: the two options would seem to be to raise the level of the living room floor or to ramp it. I’ve drawn out a couple of ramping scenarios, but need to think on it some more. It’s 21 inches down, so that’s a lot of ramp! The backyard: there is currently a small concrete patio outside the back door, and adding a ramp would pretty much use up the whole patio. I’d like to extend the patio (make it a porch, really) along the whole back of the house, raise it to the level of the house, and add french doors to the new porch from the family room. This would also provide covered access to the garage, which is a separate building. <understatement>That would be a big project<\understatement>. The backyard, ii: the backyard slopes away from the house starting a step down from the patio. I haven’t really started to think about access to the back yet. I’m glad you found a good architect. This can be one of the hardest compromises in the building process. The bathroom looks great too. I like the light-colored wood accents. It’s nice that you can move up and down the stairs independently. My own grandmother said it was one of the best investments she had made after her lift was installed. Definitely clean out the garage so that you can load and unload inside. It’s much better for inclement weather, though I don’t recall you mentioning whether or not you have access to the house from the garage? Thanks for the info, I am a single mother of a 4 1/2 year old daughter that is physically Handicapped. I just recently bought our 1st home & I am looking for some form of financial assistance to make some modification to the home so that it is wheelchair accessible inside and out. I know that there must be programs (both government & privately funded) to help Lower income families in these situations. I have spent hours on the internet searching & found nothing that is clear… I am hoping someone knowledgeable in this area can help…. THANK YOU! Very professional looking job. If you have any questions in the future about concrete restoration please email me. I’d love to help you. I just found this page. I’m buying a small apartment house and remodeling the first floor to be all-accessible. A new bathroom (no more climbing into a bathtub), master suite, partially new kitchen (where I’ll finally be able to reach the stove!). Is your project finished? Are there any “if I knew then what I know now” revelations/regrets? I’m hoping mine is mistake free (ha ha). 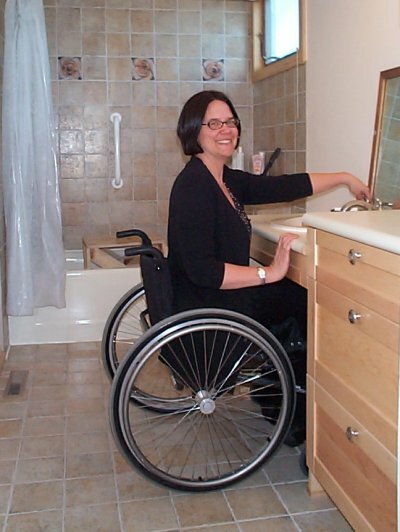 Since I wrote this, we have re-done the kitchen again, and it really is fully accessible to me. We have also built a deck outside our back door, which is 9″ above grade, with a ramp down to ground level. Bathroom – we did not put in a hand held shower head, and we should have. The fixed shower head is lower than normal, but it can still be a little dicey to reach up to adjust it. Kitchen – we have a combination of lowered and standard height counters, which is nice. The stove top is in a lowered counter, and that’s awesome for me and fine for my husband, who is not very tall. The sink is also in a lowered counter, and if I were doing it again, I would have 2 sinks, one lowered and one standard height. We thought about it at the time, and it seemed wildly extravagant, but it’s seriously painful for my husband to do the dishes in a sink at that height. I haven’t persuaded him to use a stool yet :-). I guess the takeaway here is to consider the needs of both standing people and seated people. 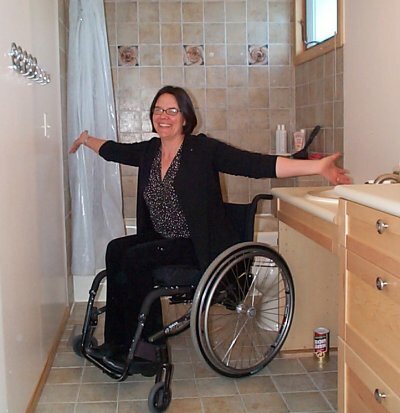 I used a bunch of reference material in these projects, but found Margaret Wylde’s Building for a Lifetime: The Design and Construction of Fully Accessible Homes to be the most useful in terms of practical implementation. Wylde does make the point about designing for both ambulatory and non-ambulatory users quite strongly, but I was concentrating so hard on my needs that I forgot about my husband’s. Outdoor ramps – seriously make them as long and shallow as possible. Ours are somewhat better than 1:20, but there is no such thing as too shallow, especially when you’re pushing a manual chair with groceries. And look at all clearances (hallways, between things in the bathroom and the kitchen, between furniture. Again, there’s almost no such thing as too much clearance, except maybe between the fridge and the counter (carrying things). I’ll think about this some more, maybe write an update to this page. I hope to hear more about your project, which I’m also hoping will be mistake free!